september is half way, and it is finally getting cooler in tokyo. one day we had typhoon coming towards the island of japan, and after buckets of rain, the temperature dropped quite significantly. for the past few days i can feel the gentle, autumnal chilliness which my body remembers from a year ago. despite the rain outside, the humidity seems to be much less, and the cool breeze so comforting. for the first time in months, we opened a bottle of red wine – today’s dinner is tagliatelle bolognese, cooked with a generous portion of the wine coming from the same bottle. the tip of this sauce is to simmer the vegetable in low heat for 15 – 20 minutes (this way it gives some sweetness to the sauce). then add meat, put the flame up to medium heat, cook it for a few minutes until the meat is brown, then pour the wine, put the halved cherry tomatoes, put the lid on, lower the heat again to minimum and simmer again for at least 30 minutes. add salt & pepper to taste at the end. after turning off the heat, it’s even better if you can leave it for 1 – 2 hours for the taste to settle, and reheat before serving. the ingredients above should serve 4 people at least. i sometimes make the double portion of the sauce, first to eat with tagliatelle or penne or rigatoni, etc., and then a few days later i make one of my signature dishes, lasagna (i hope to upload the recipe sometime in the near future). tagliatelle bolognese reminds me of italy, especially the central part of the country – bologna, of course, where the dish was originated, firenze, siena, roma… whenever i miss the beautiful landscape and their delicious cuisine, i prepare this dish as if to compensate the missing piece of la dolce vita. this is japanese curry & rice. in fact, the majority of japanese people love this dish. it is one of the dishes in japan, in my opinion, that you would think about cooking for your boyfriend for the first time. we don’t make curry paste from scratch actually, but use curry blocks instead which melts into the broth. you can get the blocks in any grocery store, and there are at least 10 different brands, each of them offers “sweet”, “medium spicy” and “spicy” tastes, lying next to each other on a big shelf. i know it’s a bit like cheating, but that’s how our mums & grandmas have traditionally made the dish all along (i don’t think it goes back to my great-grandmother’s generation though). it’s so handy that people make curry all the time, which is probably very different from what non-japanese people would imagine what we would make at home. we vary what to put in the broth, for example this time i used chicken, onion, zucchini and celery. the red stuff i am putting on the dish is called 福神漬け, fukujin-zuke pickles. 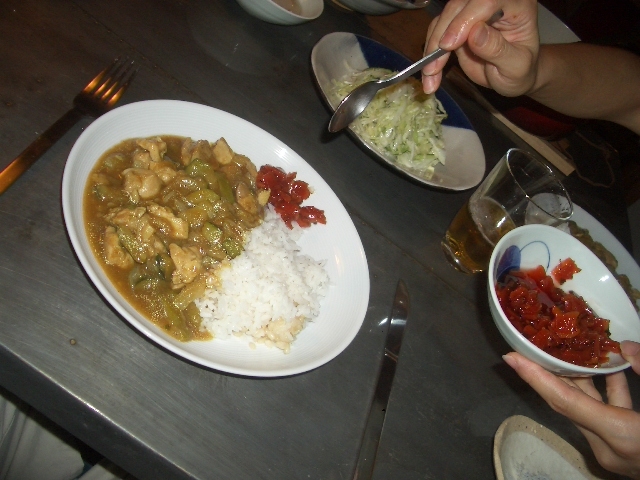 the taste is sweet & sour, goes very well with slightly spicy curry sauce. 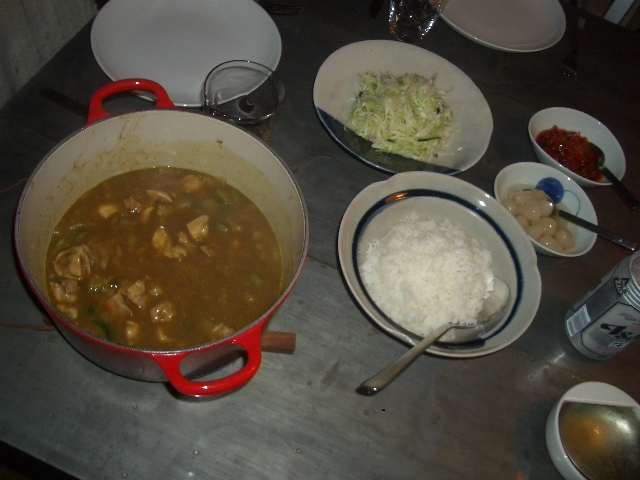 it is always, always served with the japanese style curry & rice: the-curry-wouldn’t-be-the-same-without-it, kind of thing. this one too, we don’t really make at home, but buy ready-made one at a grocery shop. the colour is dreadful, but picturesque (no?). in holland, there are street vendors who sell poffertjes, handmade mini pancakes, which are very puffy and covered with a lot of powder sugar. influenced by the small, bite sized pancakes with the sweet smell of melted butter, i made these mini pancakes at home for breakfast. somehow, i feel that it makes pancakes a special treat if you make them in small pieces. 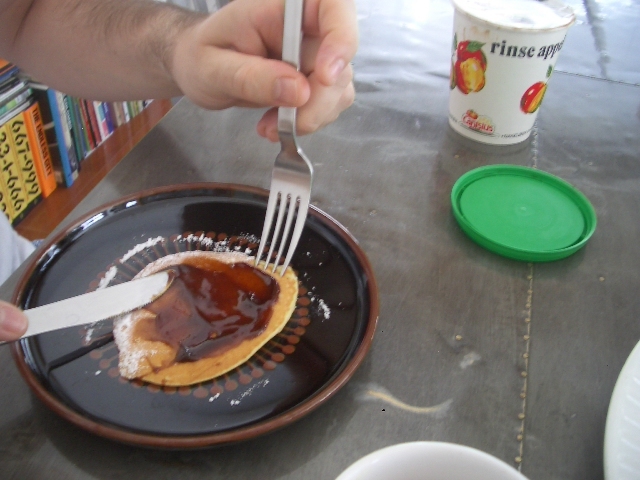 my dutch hus puts “appelstroop”, apple syrup, on top of the pancakes and indulge himself with it in one go. 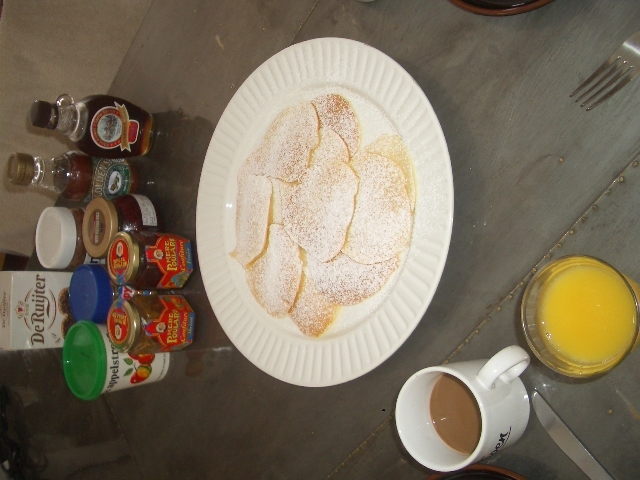 eat the pancakes with all the goodies you have in your kitchen – fruit preserves, maple syrup, honey, nutella, etc. and if you happen to find it, appelstroop also. enjoy! Comments: 0 Posted by: Small Tokyo Kitchen Categories: dutch?